Astronomers have the "all-clear" for an exciting test of Einstein's Theory of General Relativity, thanks to a new discovery about S0-2's star status. Up until now, it was thought that S0-2 may be a binary, a system where two stars circle around each other. Having such a partner would have complicated the upcoming gravity test. But in a study published recently in The Astrophysical Journal, a team of astronomers led by a UCLA scientist from Hawaii has found that S0-2 does not have a significant other after all, or at least one that is massive enough to get in the way of critical measurements that astronomers need to test Einstein's theory. The researchers made their discovery by obtaining spectroscopic measurements of S0-2 using W. M. Keck Observatory's OH-Suppressing Infrared Imaging Spectrograph (OSIRIS) and Laser Guide Star Adaptive Optics. "This is the first study to investigate S0-2 as a spectroscopic binary," said lead author Devin Chu of Hilo, an astronomy graduate student with UCLA's Galactic Center Group. "It's incredibly rewarding. This study gives us confidence that a S0-2 binary system will not significantly affect our ability to measure gravitational redshift." Einstein's Theory of General Relativity predicts that light coming from a strong gravitational field gets stretched out, or "redshifted." Researchers expect to directly measure this phenomenon beginning in the spring as S0-2 makes its closest approach to the supermassive black hole at the center of our Milky Way galaxy. This will allow the Galactic Center Group to witness the star being pulled at maximum gravitational strength - a point where any deviation to Einstein's theory is expected to be the greatest. "It will be the first measurement of its kind," said co-author Tuan Do, deputy director of the Galactic Center Group. "Gravity is the least well-tested of the forces of nature. Einstein's theory has passed all other tests with flying colors so far, so if there are deviations measured, it would certainly raise lots of questions about the nature of gravity!" "We have been waiting 16 years for this," said Chu. "We are anxious to see how the star will behave under the black hole's violent pull. Will S0-2 follow Einstein's theory or will the star defy our current laws of physics? We will soon find out!" The study also sheds more light on the strange birth of S0-2 and its stellar neighbors in the S-Star Cluster. The fact that these stars exist so close to the supermassive black hole is unusual because they are so young; how they could've formed in such a hostile environment is a mystery. "Star formation at the Galactic Center is difficult because the brute strength of tidal forces from the black hole can tear gas clouds apart before they can collapse and form stars," said Do. "S0-2 is a very special and puzzling star," said Chu. "We don't typically see young, hot stars like S0-2 form so close to a supermassive black hole. This means that S0-2 must have formed a different way." There are several theories that provide a possible explanation, with S0-2 being a binary as one of them. "We were able to put an upper limit on the mass of a companion star for S0-2," said Chu. This new constraint brings astronomers closer to understanding this unusual object. "Stars as massive as S0-2 almost always have a binary companion. We are lucky that having no companion makes the measurements of general relativistic effects easier, but it also deepens the mystery of this star," said Do. 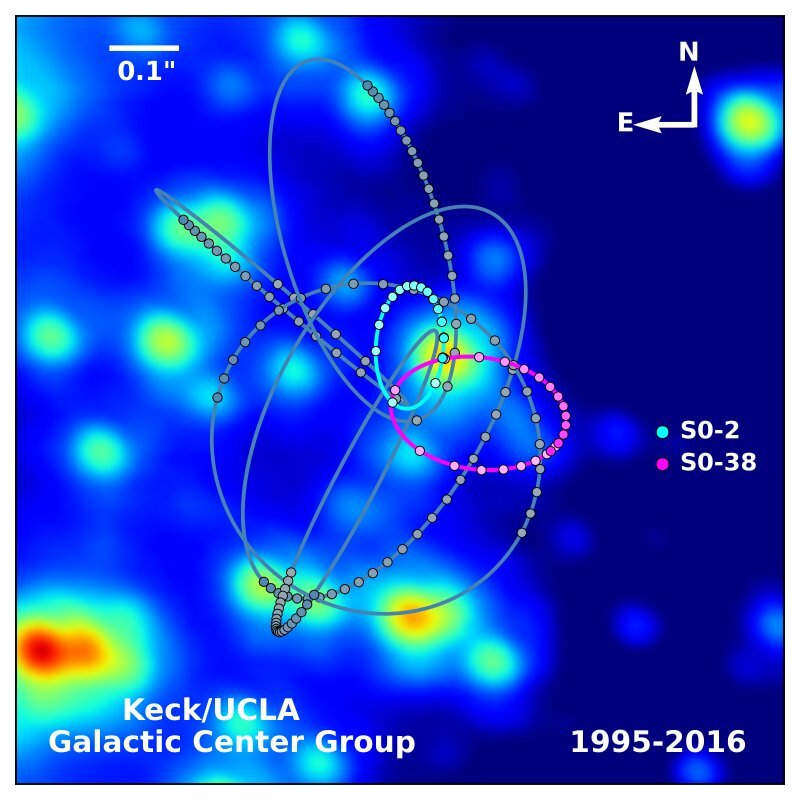 The Galactic Center Group now plans to study other S-Stars orbiting the supermassive black hole, in hopes of differentiating between the varying theories that attempt to explain why S0-2 is single.